Reviews of the Canon PowerShot G7 X from around the web. The PowerShot G7 X is designed for photographers who want the power, control and even the image quality of a D-SLR, but in a camera small enough to fit in a pocket. 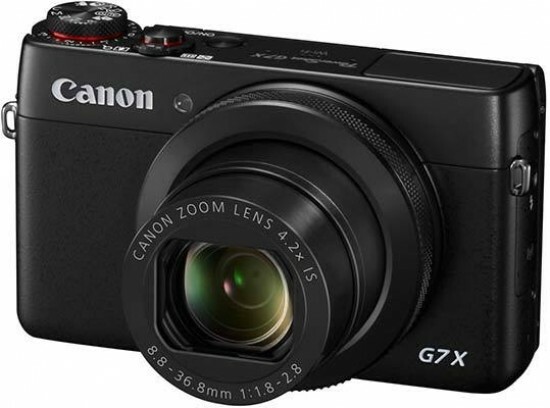 Canon's PowerShot G7X is a high-end compact based around a 20 Megapixel 1in sensor and a 24-100mm f1.8-2.8 lens. Announced in September 2014, the G7X slots roughly between the G1 X Mark II and S120 in terms of sensor size, delivering a step-up in quality over the latter, but with a body that's crucially smaller than the former. It's a strategy that's worked well for Sony's RX100 series, the leader in this category. It took more than three years for another company to bring out a camera that went toe-to-toe with Sony's excellent RX100 series of compacts in terms of specifications and features. The Canon PowerShot G7 X ($699.99) is the first pocketable compact with a 1-inch sensor not to bear the Sony brand name. The rise of the high-end compact camera has been gathering pace, with oodles of models well worth a look in 2014. Despite already offering plenty of quality products, it's taken Canon a little longer to get into the groove and deliver a large-sensor yet small-size compact. Which is exactly where the PowerShot G7 X fits into the equation.